It has long been a dream of mine to connect a robot to a artificial brain and my research with OpenWorm has given me access to develop a simulated connectome to an Lego Mindstorms EV3 robot. 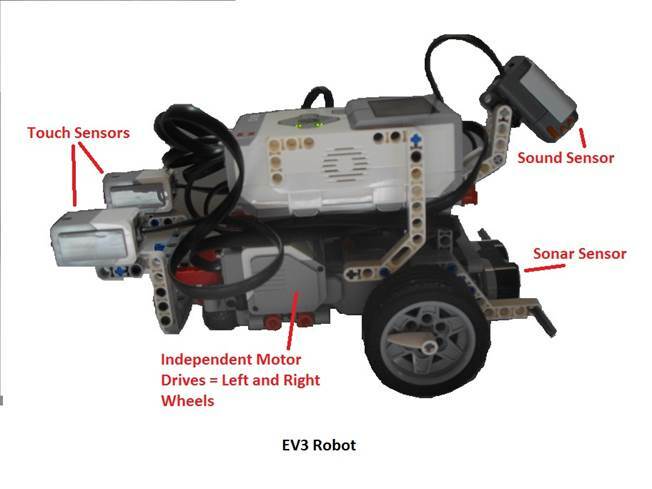 The EV3 comes with motors, sensors and a Linux based computer system that ties the sensor and motors together as well as allows programs outside of the robot to communicate with it using WiFi and Bluettoth communications. Furthermore to make the communications easier between my Connectome Framework and the EV3 robot, I use a product called Monobrick which makes this programming very easy. Researchers, in general, have a tendency to model specific animal physiology and pathways, focused on experimentation to discover truths about specific behaviors. Modeling and simulations are great tools and give us great insight into whether our observations and underlying theories of what causes those observations are true. However, modeling or simulating specific behaviors can lead to skewed interpretations by negating the organism as a whole. It is not always obvious that a small portion of an organism will deliver the same results when more components of the organism are added into the model. I label the Connectome Engine. To stimulate the sensory neurons in the connectome and to read and assimilate the output of motor neurons, I added applications for this purpose I call the Connectome Framework. The Connectome Framework are the intermediate programs between the EV3 robot and the C. Elegans connectome. Results showed the connectome was recursive in many connections and that both connectome and motor output was continuous and on-going without further stimulation. It is my conjecture that the connectome would have continued running nearly forever if allowed and unimpeded. Complete: The entire connectome is represented. However it should be noted that not all sensory organelles or inputs are in the model at this time. As an example, stretch receptors which could play an important role in C Elegans locomotion behaviors. Continuous: Like a “live” nervous system, the stimulation is continuous and active. Sensory input changes behavior and nothing more. Temporal: Stimulation changes over time and as environmental factors change. Each program is set to only fire it’s axon as certain thresholds are met, and the program will zero out (depolarize) over time. In late 2012, Lego announced that it would be coming out with a new Lego Mindstorms robot kit in the Fall of 2013. The new robotic kit would be called Lego Mindstorms EV3 and was an upgrade from the previous model of Lego Mindstorms NXT2. The primary features that made the EV3 attractive for simulation research is that it is inexpensive (~$350 USD), the computer (or Brick) is a Linux based computer and that the user could communicate with the robot via Bluetooth and WiFi communications. Having purchased a prerelease, educational version of the EV3 in early August, 2013, allowed me to build a simple robot that could mimic some sensory inputs of the C Elegans nematode. The EV3, like its predecessors, has limited sensory inputs (Four total) and motor outputs (Four total). I decided on three touch sensors and one food sensor simulation. The robot is comprised of a left and right body touch sensor, a sonar or nose touch sensor and I use sound to simulate the presence of food. Each of these sensors stimulate specific neurons of the Connectome. I attached two motors to the EV3 on either side to simulate the right and left body movement of C Elegans. In order to interact with the robot I created two programs: an Input program that reads the sensors on the robot and stimulates the appropriate neurons when specific thresholds are met, and an Output program that accumulates stimuli from motor neurons and in turn sends the amount of power to be applied to each of the two engines. 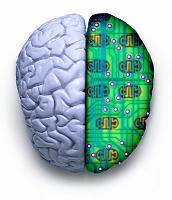 These two programs are the intermediary applications between the robot and the connectome. Each stimulation of the neurons listed, sends a value of one (1) to each of the individual programs that represent these neurons in the connectome. Lists the neurons that will be activated by each sensor once the threshold is met or exceeded. These neurons are listed in a data grid and can be changed at will. The clear and reset buttons at the bottom of each grid will clear the grid or delete all neurons. Reset will restore the defaults. The Food grid has a Send button that allows me to send the weighted value of one (1) to the neurons listed in the grid on demand. This is useful if the researcher wishes to stimulate food neurons without having to make a lot of noise. “Timer On/Off” allows the researcher to start or stop polling of the sensors. “Clear” just clears the status box to the right. “Send Poison” sends a weight of -99999 to all the neurons in the connectome which tells the neuron to kill itself. This is used to stop the connectome very quickly rather than stopping 300 programs individually. “Test Sensors” simply reads the sensors on demand and displays the results in the status box. “Exit” ends the Input program. is the status box that shows whatever activity is going on in the Input program. As a sensor is activated, the sensor and value is displayed here. The Output program captures motor neuron outputs and displays the values in a matrix whereby each cell of the matrix represents a body muscle of C Elegans. Muscles 7-24 (body muscles as opposed to head muscles) are accumulated into a value of either left or right, and the value is sent to the respective motor on the robot. The Researcher can set a maximum motor output whereas a motor is running at full speed when it’s value is set to 100. This is usually too fast on smooth terrain so I default the max value to 20 but this can be changed at any time and on the fly. The value of 20 for motor speed represents the condition whereas if the accumulated value exceeds 20, the Output program will reset the value to 20. The Output program communicates to the robot using Bluetooth communications and the Monobrick API. Viewing the matrix, the left body muscles are represented on the left as MDL01 – MDL24, MVL01-MVL24 and the right body muscles are represented on the right as MDR01-MDR24, MVR01-MVR24. The values (the picture shows Zeros) will change as these muscles are individually stimulated. 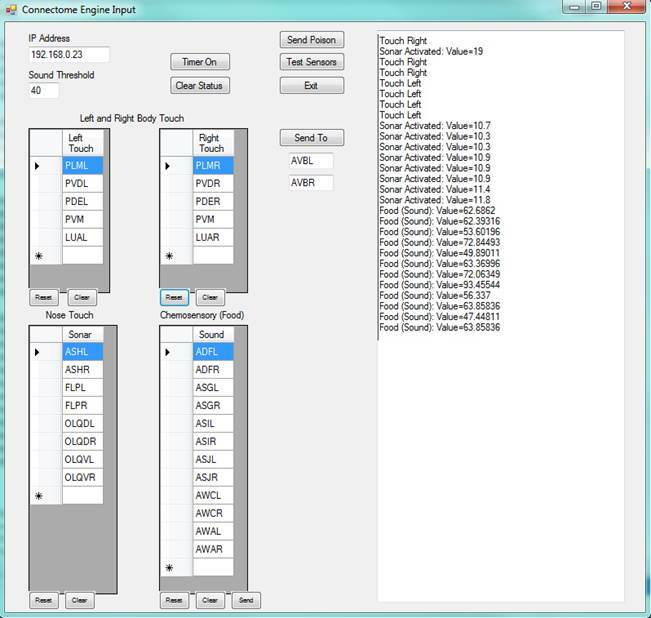 The labels at the top LT and RT will display the accumulated values. “Threshold” is the number of seconds an accumulation of muscle stimuli can be dormant before the accumulator is set to zero (0) or depolarized. “Port” is the receiving port for UDP (User Datagram Protocol) communications from the motor neurons. 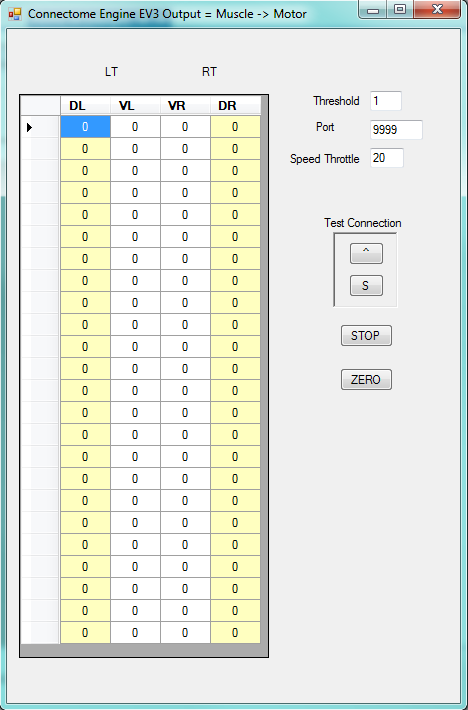 “Speed Throttle” is the maximum speed the Researcher wants to allow the robot to run. Twenty is the default and represents 20% of full motor speed. Under Test Connection, there are two buttons: “^” and “S”. These buttons allow the user to move the robot forward (^) and to stop (S) the robot. This makes sure the Bluetooth communications is working. “STOP” forces the robot to stop and disconnects any further comminications. “ZERO” simply forces the matrix values to zero (0). The Connectome itself is comprised of 300 individual programs that make up the C Elegans connectome. There are 300 because no other neuron has any documented connections to CANL and CANR so I do not activate these two neurons. I created a startup program, RunConnectome.exe, that reads a local Microsoft SQL 2012 database that contains the name and port of each individual neuron, the neurons and/or muscles that it connects too and the weighted value determined by the number of connections the pre-synaptic neuron has to the post-synaptic neurons it connects too. RunConnectome.exe starts each program (neuron) based on these values. 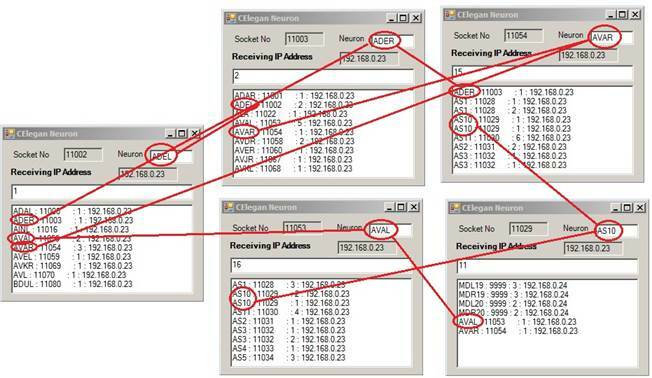 Each neuron program communicates with its linked neurons using UDP (User Datagram Protocol). UDP uses the port and IP address of the program it wishes to communicate with and sends the weighted value to the program(s) when a threshold is met of accumulated values. The single neuron is assigned a Socket or Port number which identifies the Neuron for the User Datagram Protocol (UDP). 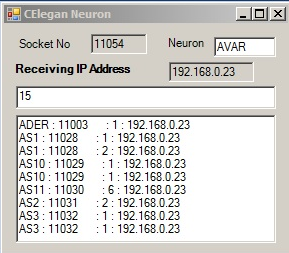 This image shows the Neuron AVAR is assigned port 11054, has just received a value of “15” and when its axon fires, it will send a value of 1 to ADER (port 11003), a value 1 to AS1, another value of 1 to AS1 (two connections to the same neuron represent a synaptic junction and a gap junction). Repective values will be sent to AS10 = 1 and 1, AS11 = 6, AS2 = 2, and AS3= 1 and 1. Each neuron program must accumulate a value greater than Fifteen (15) before the threshold is exceeded and the Axon fires, or the program sends values to all the neuron programs it connects too. In addition, there is a timer control that triggers every 200ms and if there is no input activity in that 200ms, the accumulation counter is set to zero (0). This simulates the action potential of the neuron. The diagram above shows just five (5) of the neurons as they are being activated. The red links show the complexity of the connectome and the recursive structure. Note that AVAL stimulates AS10 which in turn stimulates AVAL. There is also a built-in recording function that can be set to record each axon firing into a data table that tracks when a synapse is fired and the weight that was sent to that neuron. I use this data later to do a raster plot. The first segment is the EV3 running on the full connectome model. This demonstrates that the connectome (neurons and their connectivity) gives rise to the behavior that I would expect; i.e. a natural state and food stimulation moves the worm forward, nose touch stimulation causes the worm to move backwards and then begin moving forwared again. There is no other programming interfacing to the the EV3 robot other than the connectome interaction. The second segment is from the work presented in the paper "Gait modulation in C.elegans: an integrated neuromechanical model (2012) Jordan H. Boyle, Stefano Berri and Netta Cohen". I created a connectome of just the AVB, DB, DD, VB and VD neurons and stimulated the AVB neurons which in turn did show that this basic circuit does indeed cause locomotion in the C Elegans nematode. The third and fourth segments show the work from the paper "Synaptic polarity of the interneuron circuit controlling C.elegans locomotion (2013) Franciszek Rakowski, Jagan Srinivasan, Paul W. Sternberg and Jan Karbowski". First I ablated (did not activate the programs that represents) ASH and AVB, and second I ablated the neuron DVA. In both cases the robot would move forward but when reverse direction stimuli was introduced as with the sonar=nose touch, the robot would not reverse for an ordinate amount of time showing, as the paper indicates, the important role of these neurons in the connectome. From my work in the neurosciences, I added a log for each time a neuron is stimulated and created a raster plot of neural activity to show the connectome activity on a temporal axis. The Excel Spreadsheet (RasterPlot.xlsx) shows each neuron and muscle as it was stimulated and how much weight was applied over time.